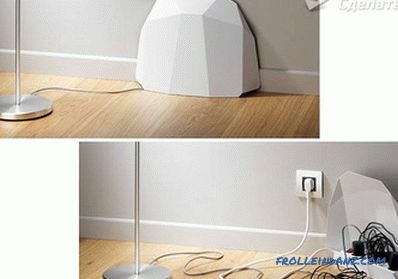 Absolutely ugly, when after repairing the premises of the wire are not hidden in the wall, but lie randomly on the floor or hang on the wall. They not only spoil the overall picture of the room, but also can lead to an accident. 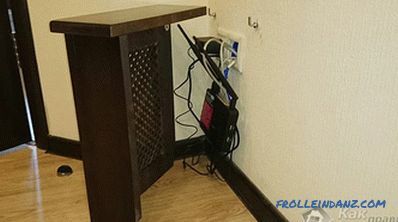 In some cases, you have to think about connecting a device and not spoiling the design of the room. 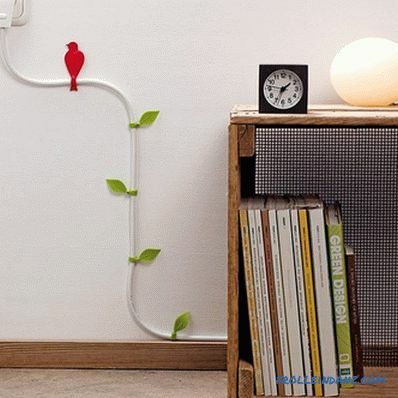 Of course, you should pay attention to how to hide the wires in the apartment. One or another household appliances are connected in each house, and in any case, the wires on the wall from these devices can be striking anyway. 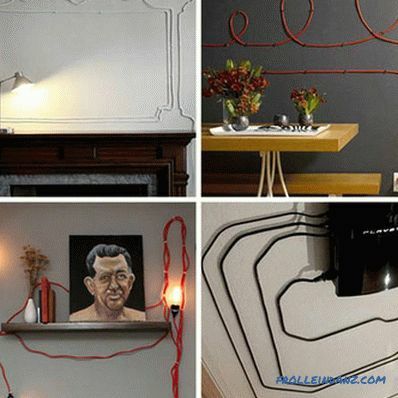 This article will give you detailed instructions on how to hide wires on a wall, in a wall, and in the floor. First with a wall chaser is needed, removing the remnants of plaster and concrete, cut in the wall of the chalet, which will hide all the wires. The wiring should be placed in a protective sheath - corrugation, which serves to protect against external adverse effects. 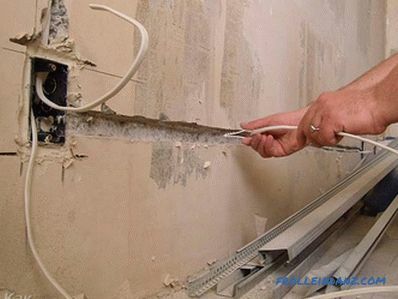 Then the wires should be laid in the cut channels, after which the wall must be plastered. 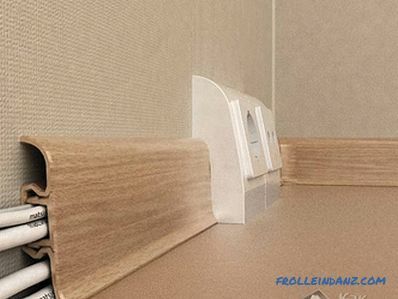 To hide the wires in the wall, you have to break its integrity, and you often don’t want to do this, as the interior will suffer, and the work is connected with dust and debris, and the wall is subject to reconstruction, which implies certain expenses. 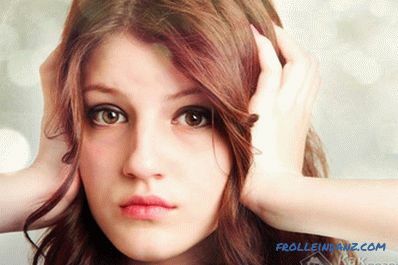 Therefore, you can use other, more profitable ways in which you do not need to resort to shtabeniya wall. 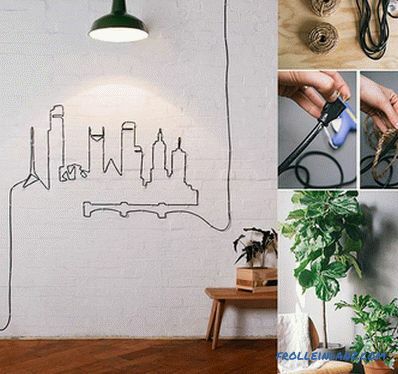 If you have an artistic taste, you can fix the wire on the wall, making it a picture. It is quite clear that the native, half meter wire for these purposes is not enough. 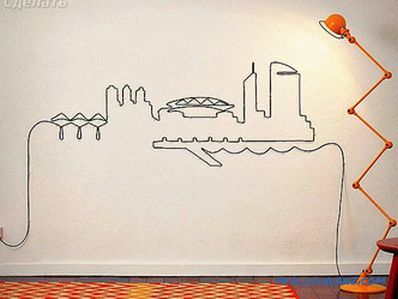 Choose a suitable drawing, and transfer its contours to the wall, making a non-greasy drawing with a simple pencil. Now you need to calculate the required amount of wire. 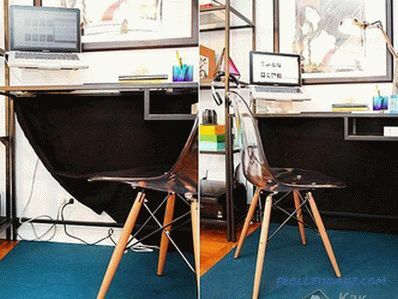 To do this, you can attach a kapron thread to the wall so that it repeats the pattern. Then its distance can be measured. Do not forget to add the length from the picture to the outlet and to the source of electricity consumption - add a meter to the reserve, and you will receive the required quantity. Manufacturers of wires often do not indulge in an abundance of colors of the wire, so you have to choose from what is - black or white. 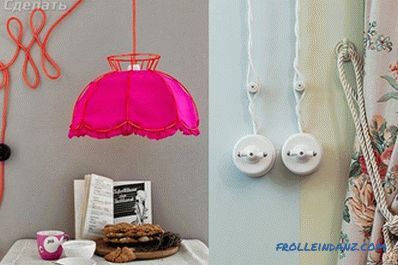 If these colors do not suit you, then you can buy an extension cord, which can be pink or red. 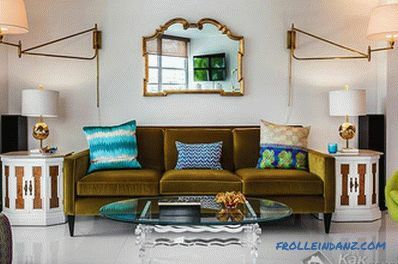 Do not rush to rely on your opinion - try to attach a strip of colored fabric to the wall and you will immediately see if the chosen color fits and whether it will be in harmony with the general situation. If you decide to make everything simple, but with taste, then you can fix the decor on the wire or come up with your own, something original. You can find a different approach - wires masking, not hiding, and this will help existing elements of the room, for example, door runners, baseboards, ceiling moldings, as well as risers heating. With the right approach to work, wiring can be made almost imperceptible, which will have a positive effect on the interior of the room. Usually low-current wires (Internet and telephone) do not cause difficulties in laying, they can be hidden in baseboards, under metal thresholds or in trim. When laying the power cable need a different approach. 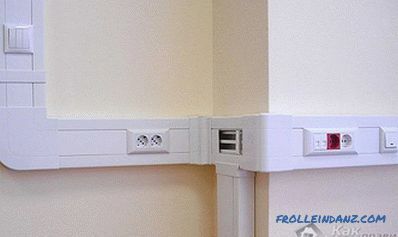 It is problematic to stretch the power wires along the wall, since they are of a large cross section and almost always white, which significantly distinguishes them against the background of the wall. Often, all electrical communications in our time are laid by a hidden method, but due to various circumstances this option of laying is impossible, for example, when, when the repair is done, it becomes necessary to install additional sockets or switches. Almost always the house has a section of wiring to be insulated into the wall or closed using a cable channel, which is a plastic box - it will protect the electrical wires from mechanical damage. The box has an attractive appearance and in this case it can be used as a decorative element. This option is also a solution to fire safety problems. The laying of wires in a bathroom can create a particular difficulty when the walls and floor of the room are fully tiled. If there is a ceiling in the bathroom, wires can be hidden in it, and if there is no such possibility, then a cable channel will be of help in this situation. It is not recommended to install sockets in the bathroom, and if you don’t have any urgent need, give up on this idea and limit yourself to installing lighting fixtures.If the socket is needed, then worry about safety, and the socket must be waterproof. It is also worth paying attention to how the wires are laid on the floor. To date, special plinths are produced, in which a cable niche is structurally provided. The top panel of the plinth is removed, the cable is laid there, then it is put back in place. 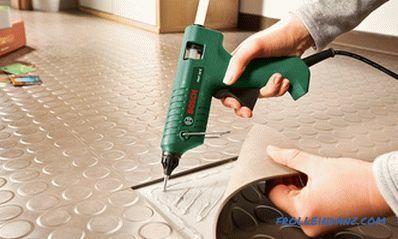 The advantage of this method is convenience and work without dust. 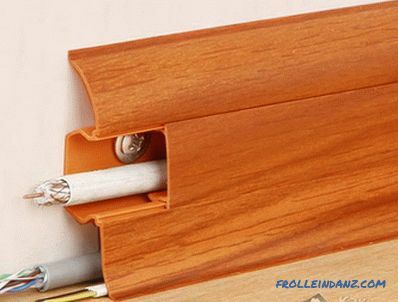 In such a baseboard can hide and computer wires, and the network cable. 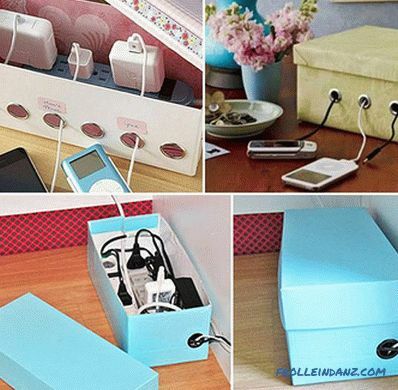 Often we are hampered by wires from various chargers. In this case, you can do it like in the photo - hide them in a specially made box. 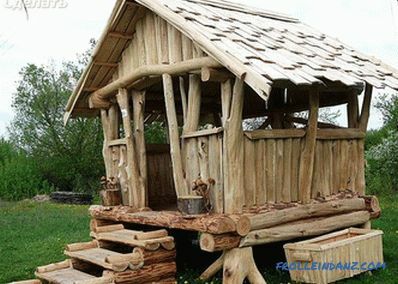 If you can offer your method, then at the end of the article you can add a comment and attach a photo of your invention to it. 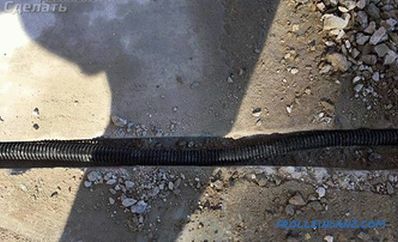 If you need to hide the wires in the floor, then using the wall chaser or perforator in the concrete is strobe, the wiring is inserted into the corrugation and fit into this notch. Upon completion of work, the installation site is leveled with a sand-cement mortar. 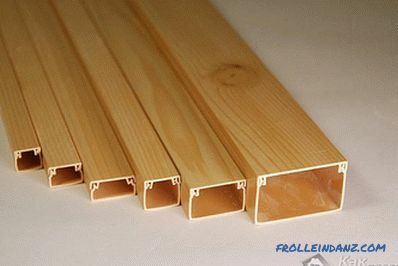 If there is a wooden floor in your house, in order to conduct the wiring under it, you will have to remove the boards and live the cable in a metal pipe. As a rule, the TV is placed on the wall in front of everyone, so the wire from the TV will be very noticeable to those around you. 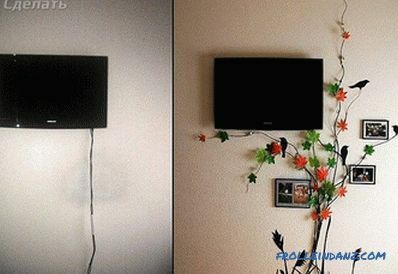 It is best to hide the wire in the wall, and make sockets behind the TV. 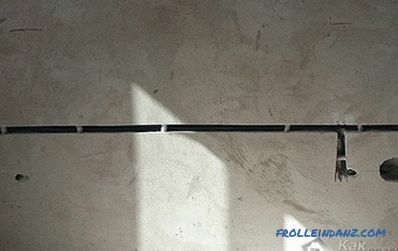 For this purpose, a wall chaser in the wall, and if this is not the case, then a perforator is used to make a groove, the wires are assembled and laid into the corrugation. 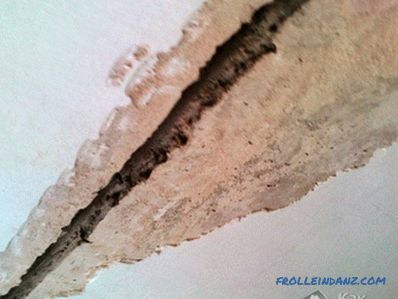 Then the wires with the help of special fasteners and brackets must be fixed in the groove and plastered. If you don't need to completely hide the wire, you can disguise it. All the subtleties associated with the wiring in the house, it is best to provide at the stage of repair of the room, so that later there were no problems. how to properly glue vinyl wallpaper.